Egyptology has as its object of study the history, practices, and conceptual categories of a culture, which was remarkably prolific in terms of written texts, art, architecture, and other forms of material culture. The richness of this culture, of which we find ample traces, allows us to reconstruct religious thinking, economic systems, intimate details of daily life, as well as ancient pathology, to name just a few aspects. The knowledge of Egyptologists, archaeologists, linguists, geologists and all other professions that are involved in research in Egypt , reflect the interdisciplinary approach that is needed to make sense of such a wealth of information. Truly encyclopedic knowledge in this day and age means to have access to every relevant source, of guaranteed quality, with clear guidelines on how to search for the desired material with the potential to open unexplored research paths. For thirty years the Lexikon der Ägyptologie (LÄ, edited by Wolfgang Helck, Eberhard Otto, and Wolfhart Westendorf), seven-volumes published between 1975 and 1992, has been the standard reference work in Egyptology. This great body of knowledge is still extremely useful for professionals in the field, even though it begins to show signs of age due to recent archaeological discoveries in Egypt and new insights or changed views. The target of the UEE is both the scholarly public and the popular interest in ancient Egypt . For an English reading public, the LÄ poses a number of problems. For example, most of the texts and all entry titles are in German, even though some articles are in English or French (and there are English and French indices to the article titles). The development of research and scholarly discourse makes revision of the range and configuration of entries of the LÄ urgent, but to publish a revised edition in print is prohibitively expensive. The advantages of online publishing are obvious. It is no longer as costly to produce a new edition, because single encyclopedia entries that are in need of revision can be updated whenever necessary. Through a rigorous version control, and the continued availability of older versions of an entry, the articles can be cited similar to printed versions. To ensure the highest academic quality, all articles incorporated in the UEE will be peer reviewed and published through the University of California online publishing website eScholarship under the title: UEE Open Version. A key feature of this project is its innovative approach to data access by making use of hypermedia. Hypermedia provides opportunities for the linking together of information in ways not otherwise possible, enabling it to be seen in new ways and facilitating the creation of new knowledge. Online media provide opportunities that are not available in printed versions. Innovative search functions and data mining that make use of textual, pictorial and, in future, audiovisual formats, have an important heuristic function that by far supercedes that of searches in printed volumes. Rather than only presenting a conveniently accessible body of excellent content, the UEE will ultimately open up new research methods, through combining and interweaving the knowledge of eminent scholars with original data in completely new ways. Furthermore, the UEE will solicit constant feed back from its users, which allows a continuing development through their comments and suggestions, as well as through increased technological possibilities. 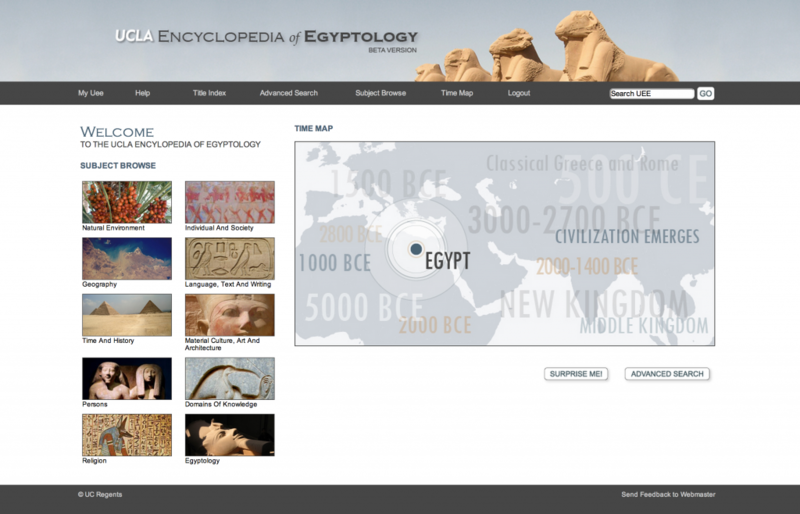 Furthermore, the UEE will provide links to current and good quality Egyptological content on the Web. Annotated summaries of existing Web sites clarify what the strengths and weaknesses of these different pages are, according to the criteria provided by a panel of scholars.